These kids will graduate THANKS to your support! Nineteen students graduated on July 1st. Staff and teachers are proud of what these kids accomplished during those three years because they grew up to become more responsible and respectful citizens. We thank the sponsors for being part of that journey, the parents and PAI’s staff. Thanks to your support 19 students will graduate in July 2017. 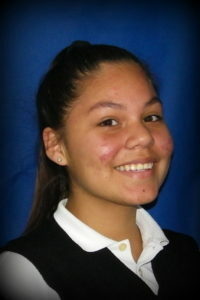 Citlalie Alvarez Magallanes (14 years old): At Panamerican Institute, I learned to value friendship, have respect for others and be organized; I want to continue growing as a person, I want to learn to think before I speak, to not be lazy and not worry so much about aspects of my life I cannot change right away. I am proud of myself for working on becoming a better person. I want to continue my education and become a Pharmaceutical Chemist; I also want to learn how to play guitar. I plan to work as a waitress so I can pay for my education. Thank you to my sponsors for helping me these 3 years to get an excellent education here at PAI, I hope that good comes your way! 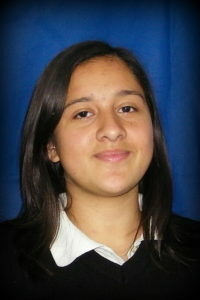 Danna Valeria Beltrán Acosta (15 years old): I am proud of myself for graduating from secondary school with good grades. I want to study Administration and to do that I must move to the state of Sinaloa and stay with family members who have the financial situation to support me during my Preparatory school years because my parent cannot afford it. I want to join the Marching Band because I like the organization they have. I plan to work as soon as I get settled so I can help with my school expenses. In 10 years, I picture myself graduating from the University and being independent. I am very grateful to my sponsors for helping me these years, it was a pleasure to have met you. Melissa Alejandra Beltrán Medrano (14 years old): I will remember the lessons I learned here at PAI: to make an effort in order to accomplish my goals and to know that I will always have people beside me supporting me every step of the way. I feel proud of myself for learning English, when I started classes I barely knew the language and now I understand a lot of it. I would like to study to become a Dentist because I am amazed by how our teeth can change during any kind of treatment; I want to have my own office. I want to start working at Preparatory school but later on I want to work in a Dentist’s Office to learn. I know that I will have my teachers from PAI, my parents and my friends to support me in life, but I also must learn to ignore all the bad comments about me and to have more hope. In 10 years, I see myself single in my own home, with a car and a dog, and, of course, helping my mother with her expenses. 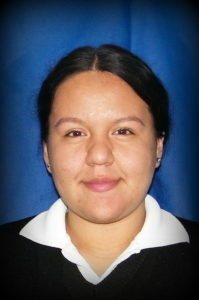 I thank my sponsors for their support; I hope they can continue helping other students like me at Panamerican Institute. Alvin Antonio Chávez Fonseca (14 years old): My teachers at PAI taught me the importance of values such as respect, humbleness and honesty. One thing that I will remember is the time I fell in the Computer Laboratory, it hurt but it was also funny. At Preparatory school, I want to study Clinical Analysis and join the Karate club, and at the University I want to study to become a Pharmaceutical Chemist. I want to start working when I turn 15 years old to help my family. In 10 years, I want to have a steady job and start my own family. Thank you to my “adopted” sponsor for the support to my family and this school. 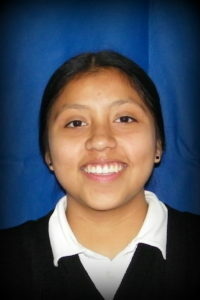 Daniela Chávez Jiménez (14 years old): I feel proud to be a Panamerican Institute graduate because of all the things I learned here, even how to sweep and clean. I want to study Accounting, since I learned the basics here at PAI and I liked it, I think it will be easy. At Preparatory school I want to join the Soccer team, and at the University I want to take a Photography class. I plan to start working at my third semester of Preparatory school to pay my own expenses and that way, help my parents. I want to thank my sponsors for the help, even though I never met you I feel great affection for you; I wish you the best in life. José Alfredo Contreras Rodríguez (14 years old): During these 3 years I learned to get along with everyone and to love myself just the way I am. I want to improve my attitude towards my friends and leave some bad friendships behind. I would like to study to become a Dentist, because I am agile with my hands. At Preparatory school, I want to join the Guitar club because I like to sing and play the guitar; and at the University I want to join the Soccer team because I have liked that sport since I was little. I would like to work as a waiter during Preparatory school. In 10 years, I see myself having fun and going out to concerts with my best friend. 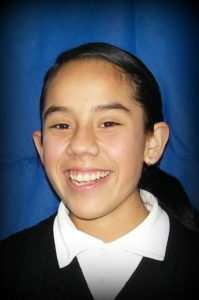 Marisol Cruz Gómez (14 years old): At this school, I learned to be punctual and respectful to others. At Preparatory school I want to study Clinical Analysis and join the Soccer team, at the University I want to study to become a Veterinarian because I like to help all animals. I plan to work at my godmother’s grocery store during Preparatory school to pay for my own expenses. I would like to make a change on how I talk to my teachers and classmates, and to get rid of all the negativity in my life. In 10 years, I picture myself very happy because I graduated from my dream career at the University and have a job in that field. Thank you so much to my sponsors, thank you for the gifts and cards you sent me. Évelin Cuevas Nicolás (15 years old): Here, I was taught to get along with everyone and to value everyone’s time. I am proud of myself for always having good grades and good behavior. At the Preparatory school I want to study Social Work and join the Marching Band, I also want to get a job. At the University, I want to study Law because there is a lot of injustice in this country and I want to make a change in people. In the future, I would like to spend more time with my family because later I want to live in Canada and travel to Australia. I appreciate the support from my sponsors, I am very happy that Panamerican Institute has people like you to help them. 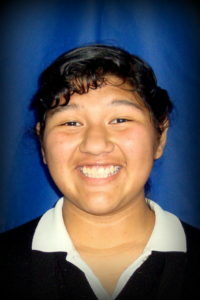 Yisel Espino Becerra (15 years old): Here at PAI, my teachers taught me to value the opportunities that life gives you. At the Preparatory school, I want to study Clinical Analysis because I like analyzing substances and find out what they are composed of; I also want to get a job. At the University, I want to study to become a Pharmaceutical Chemist because I find this career very interesting. I want to improve myself and control my anger. In the future; I want to live in a house with a pool, a car and dogs with my best friend. I am grateful to my “adopted”sponsor for everything she has done for me, even though I didn’t know you well I appreciate you a lot; thank you for coming to support me at Science Fair. Estefani Flores Navarrete (15 years old): I am proud of myself for learning to move on from my mistakes and not give up so easily. I plan to leave behind all the people who have made me feel bad and told me that I wasn’t going to accomplish my goals. I want to study Odontology because since I was a little girl I like what dentists do, I also want to join the Volleyball team. In the future, I see myself with my own office and living with my best friend. 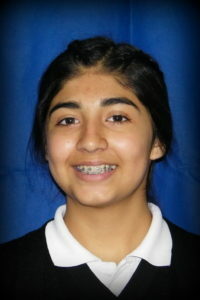 Sofía Saraí Herrera Villanueva (14 years old): During these 3 years at PAI, I learned to improve my character and to make long lasting friendships. I want to study Communication and join the Swimming team and the Photography club. I want to start working as soon as I enroll into Preparatory school. In 10 years, I see myself studying for a Master’s Degree and working. Thank you to my sponsors for helping me get an education and helping me with my future. 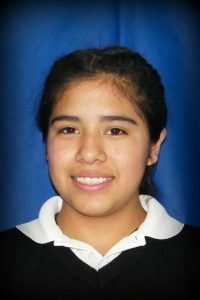 Esbreidy Yuritzi Laija Castañeda (14 years old): I would like to study Nutrition and join the Karate club at Preparatory school. At the University I want to study Sports because I want to become a P. E. teacher someday. I plan to work as a waitress during Preparatory school. In the future, I see myself married with a daughter and still hanging out with my friends from PAI. 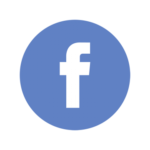 Sebastián Márquez Bautista (14 years old): Panamerican Institute taught me to be responsible and how to type quickly and correctly. I plan to study Accounting at Preparatory school and Administration at University. I also plan to work in an office related to my career. In 10 years, I picture myself living with my best friend in a big house. 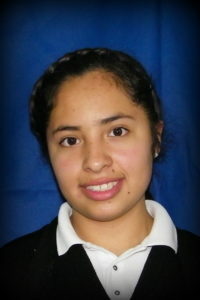 Fernanda Vianeth Mendoza Reyes (15 years old): I am proud to have learned Math very well and to have become an organized and responsible person. I want to study Accounting at Preparatory school because it relates to Administration, which is what I want to study at the University, I also want to join the Cheerleading squad. I already work as a babysitter and I want to continue working to pay for my expenses. In the future, I would like to have more trust in my family because I think that would make me a better person. In 10 years, I imagine myself working as the Manager or even the CEO of a company. I want to thank my “adopted” sponsor for the support and attention. 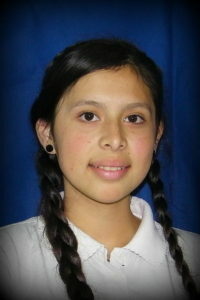 Évelin Danahí Miranda Gómez (14 years old): Here at PAI, I learned to get along better with other people. At Preparatory school I want to study Clinical Analysis because since I was a little girl I found it very interesting and also join the Dance club. I plan to work in a pharmacy with my godmother during Preparatory school. At the University, I want to study to become a Veterinarian or a Dentist. Thank you for sponsoring me and giving me the opportunity to finish my education and obtain the knowledge I need for my future. Ignacio Rodríguez García (16 years old): I want to fulfill my late mother’s dream of finishing my education; I want to study Accounting because I think it is interesting. I would like to work as soon as I enroll into Preparatory school, and look for a better place to live. In the future I want to live with my best friend in a big house. 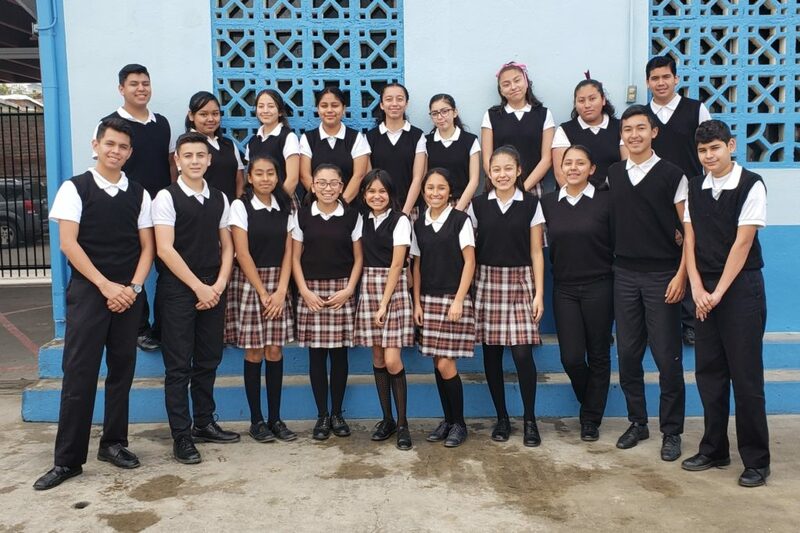 Yesenia Lizbeth Vega Pesina (14 years old): I am proud of myself for learning to be more responsible and respectful, also for having good grades all through Secondary school. I want to study International Business because I would like to work in other countries and learn other languages. I already have a job at my parents’ pizza stand at the flea market so I can help them with the bills. In 10 years, I see myself traveling to Europe and visiting Venice with my mother. After I travel I plan to get married and have two children: a boy and a girl. Oscar Bernardino Vera Cortéz (15 years old): At PAI, I learned to be more organized and to not worry so much about what people say about me. I would like to leave all my emotional troubles behind me and grow up. A fun memory at school was when the lights went off at the Computer Laboratory and my friend screamed very loud, we all laughed and also started to scream. I want to study Clinical Analysis at Preparatory school and Medicine at the University because since I was a little boy I wanted to be a doctor and help other people. I plan to continue working at the flea market, as I do now, to pay for my own expenses. Thank you very much to my sponsors for helping me with my education, for all the gifts and for the chance to meet you. 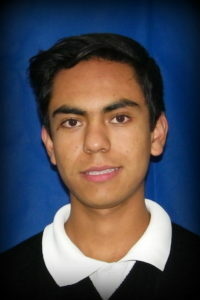 Ricardo Alain Verdugo Ramírez (15 years old): Panamerican Institute taught me a lot of things: to be more respectful, responsible, dedicated, friendly, sharing and less shy. I am proud of my good grades. I would like to change the way I speak to people so I can avoid problems in the future. I want to study Architecture and join a team, Photography, Football or Swimming. I want to start working when I turn 16 years old at a fast food restaurant. In 10 years, I imagine myself traveling with my future wife and owning a house on a mountain or forest. Thank you to my sponsors for your support, letters and gifts. If you want to help any of these students through their Preparatory Schooling, you can do it by donating through the Advanced Study Program. WE ARE PROUD TO PRESENT OUR 21 STUDENTS GRADUATING IN JULY 2015. Your support enabled these students to attend school for three years and graduate. OUR SINCERE APPRECIATION FOR GIVING THEM THE OPPORTUNITY TO PURSUE THEIR DREAMS! 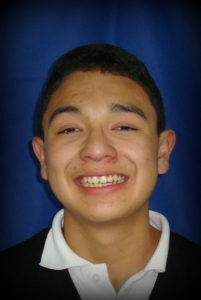 Join us for their Graduation Ceremony on July 4, 2015 at 2 P.M.
JESUS DANIEL RIVERA VILLEGAS (15 YEARS OLD): I am so happy to have attended this school because besides learning typing, computers, accounting, etc. I learn how to be in control of my reactions. I learned that the best life policies are to tell always the truth, be honest, trustworthy, respectful, punctual and polite to live in harmony with everyone. I sure will miss coming to classes every day and the fellowship with my teachers and classmates, but I am also excited to start another school where I plan to keep an average of 10. My next goal is to attend the preparatory school “Lazaro Cardenas” and then attend the Autonomous University of Baja California to study Accounting. I want to meet more people to have more friends. I would like to convince my family in 2 years to attend talks about parenting and I want to help my mom. I thank our sponsor for their generosity, their visits to our school and for Christmas baskets we received every December. I am so grateful for all the support I received from our counselor, Martha, our principal, Paty, our computer teacher Karen, our secretary Lety and everyone else who dedicated time to us. 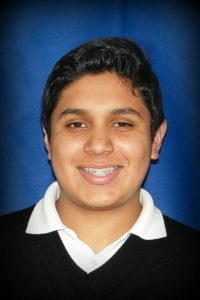 JUAN CARLOS PALOS ESPINOZA (15 YEARS OLD): After almost three year at PAI, I consider it my second home and when I graduate, I will miss my teachers who made learning fun, my classmates and the great meals Señora Vicky prepared for us every day. I am thankful to our benefactors for their support with my bus fares, medical expenses and other school supplies. I specially thank the school secretary, Letty, for taking care of me when I was ill. I think I could not have finished my Secondary school without them. Right now I am studying for the admission exam to preparatory school, graduate from it with good grades to attend the Autonomous University of Baja California. I want to improve my relationships with my friends and make new ones. I want to prove to my family that I can have a job and get a career at the same time; help them and save up money as well. In about 5 years I would like to find a girlfriend and then get married after I finish my studies. ORLANDO JESUS MAYORQUIN BERUMEN (15 YEARS OLD): My plans after graduating from PAI are to enroll in a preparatory school called “Cobach” and then attend the Autonomous University of Baja California. I want to pay back the education Panamerican Institute gave me by returning and becoming a teacher here. I also would like to study mixed martial arts and learn to dance. I want to buy a car, fix up my house and in a few years visit my grandparents in Nayarit. I want to have a family of my own in 10 years. 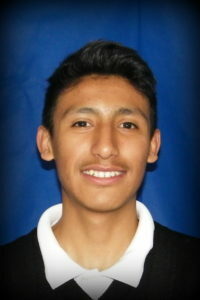 ERICK ALONSO LEYVA HADAR (16 YEARS OLD): I started at PAI being a very poor student, not only in grades, but I was not very responsible being on time or submitting my home work clean or with good quality. Now my grades are better, I am almost never late to school and home work gets done right and on time. I also learned not to fight in or out of school, but to solve problems by talking and negotiating. Now that I am graduating I am enjoying more the delicious meals we get every day, the computer classroom and the soccer court because I know I will miss them the most. I am grateful to my sponsor for all their very nice gifts they sent me and for making possible the existence of this school. I plan to start the Preparatory school in August and study until I get a Master’s Degree. I want to enroll in a soccer team, and later in a box team. I want to have a driver’s license and spend more time with my family; and show them that I can study really hard and get a good job. 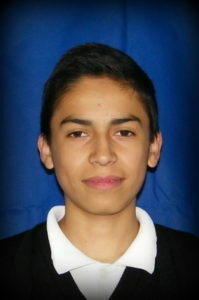 ABRAHAM MEDRANO GAMBOA (15 YEARS OLD): The thing I will miss the most from PAI is the amazing computer classroom. There is no other school with such facilities. Of course I will also miss my teachers who patiently taught us so much in every subject and also how to be responsible and make the best of our circumstances to build a better life. I am thankful to our sponsors for their generosity with students they have not even met, but have trusted to do well with this opportunity they provide to study. 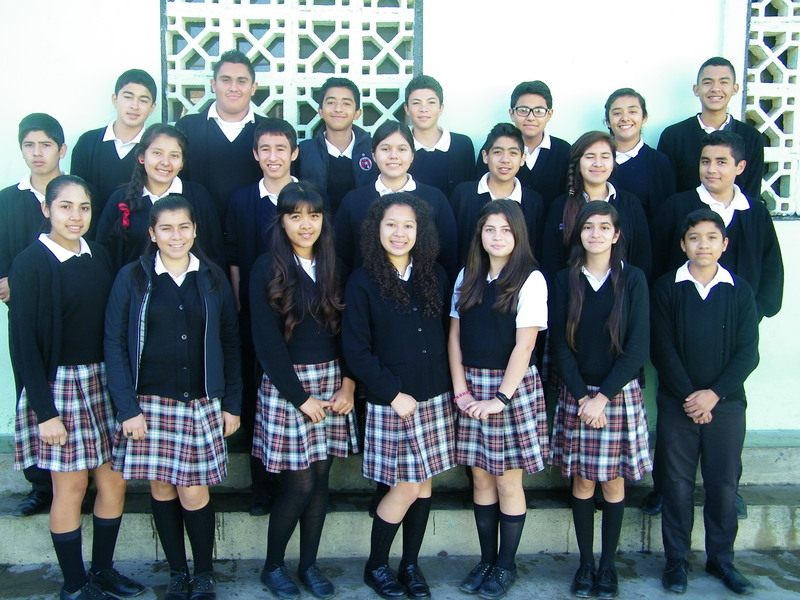 Now as a graduate from PAI, I am ready to attend the preparatory school “Cobach” and the Tijuana Technical Institute (An Engineering University) and have a job developing videogames. I want to travel with my family in a year. I want to start practicing hockey in 2 years. I would like to get along better with my friends and make new ones. In about 10 years I want to start my own family. 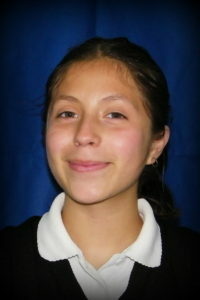 DIANA VALERIA ROBLES PARTIDA (14 YEARS OLD): O.K. I have to admit that I was one of the kids who did not know how to sweep; I did not even know to hold a broom! Now I learned not only how to seep and clean but my teachers and all personnel at PAI taught me that I should not limit myself because my family is not rich, that I should see myself as a worthy person who can reach anything I can dream and I want to be a chef. So I will take the admission test to the preparatory school, finish it in three years and start classes at the Autonomous University of Baja California to study Gastronomy. I also want to start gymnastics. I want to meet new friends and hang out with them, but keeping the old ones. 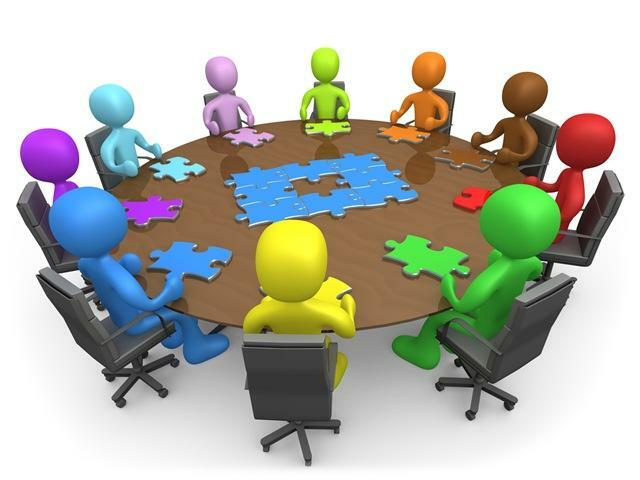 I would like to have more communication and trust with my family, and get along with everyone. I want to thank all our sponsors and teachers who put up with us; I want to thank señoras Juanita and Vicky and Señor Mauricio for all the improvements to our school. FERNANDO IVAN PEREZ SANTOS (15 YEARS OLD): There are so many things that I learned here at PAI, all the way from knowing how to use the right fingers on the keyboard to being responsible for my actions and for my life. I feel strong enough to face the challenges the future might have for me and succeed; I will improve my grades, attend the preparatory school “Cobach” and then the Autonomous University of Baja California to study Psychology. I want to improve the relationship with my father, I want to work to help with the house expenses and to pay for my sister’s schooling. I want to have good friends who always stand by me. When I am mature enough, maybe in 10 years, I want to start my own family. Now that I am graduating I know I will miss my classmates, my teachers and all the different activities at this school which I believe is the best. I know that it will be hard to find teachers like Amalia who teaches Spanish Grammar and Marcelino who teaches P.E. and taught us how to behave like gentleman. I plead to our sponsors to continue helping because I know that the next generation of students will also need your help. With all my heart I thank Señora Juanita for letting benefactor know how much we need a quality education. JESUS ANTONIO LEYVA HADAR (17 YEARS OLD): Some of the things I learned at PAI and that will help me a lot to build my future are: follow rules, but speak up if something is not right without causing problems or being rude. I am grateful to my adopted sponsors for all their support, their letters and their gifts. Thank you for all the incentives to continue my schooling and in that aspect I want to improve my grades, attend the preparatory school and the University to have a bachelors degree. I hope I can combine my studies and be able to practice boxing and soccer, and in a few years learn martial arts. I want to meet more friends and be more social. I want to improve the communication between my siblings and parents, and get along with everybody. 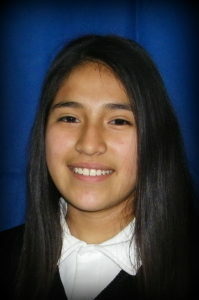 MAURA ALICIA SANCHEZ LAMBARENA (15 YEARS OLD): When I started PAI, I found very interesting all the new subjects I had, subjects such as typing, computers, science, etc. but I struggled so much to keep up with everything. Now after three years of schooling, I am a more responsible student; my school work is cleaner, I have a better character and I improved my grades because I am more organized. I can express myself better; I can get along with classmates, teachers and my own family. Thank you very much for making my life better! I will miss a lot of things and people from PAI, this wonderful little school so far away from my house. I will miss Señora Vicky’s meal, Teacher Amalia scolding, my classroom 303, my classmates and friends with whom I had such good times and hopefully will continue to do so in the future. I thank all the sponsors, teachers and PAI’s personnel who motivated me to do the best to become a better person. I also thank my school that opened its doors to me and that nourished not only my body and mind, buy my soul as well. Thank you teacher Martha for receiving us every day with a smile, thank you señora Juanita for working to raise funds to give us the best quality education possible. I sure will miss all of you! Now about my plans after graduation, I would like to finish my preparatory school with good grades and study the University. I want to learn how to drive, stop arguing with my family, specially my sister and help out my mom around the house. In about 5 years I want to travel with my parents. In 10 years I want to have my own family and a house. JOSHUA GAMALIEL GALINDO AGUILAR (15 YEARS OLD): I want you all to know how much I appreciate the opportunity to study at PAI because I learned so much here, not only in the different subjects, but also to be more responsible, to always make my best effort and to solve situations without violence. When I graduate I want to enroll to preparatory school. Once I get in, I want to be part of their soccer team, learn to play better the guitar and start martial art classes as well. I plan to study very hard to get only grades of 9’s and 10’s in all my subjects, because I want to graduate with honors and study the University to become a Civil Engineer. I want to make more friends and keep the old ones, have reunions with them. I want to get along better with my little sister and practice respect within my family and teach my sister about this important value. I want to get a good job to help my mom. JOANA ELIZABETH AGUAYO CHAVEZ (15 YEARS OLD): I am so sad to leave PAI in March, so near to my graduation, but my safety is at risk by the man who killed my uncle before I was born. The man is out of jail and lives a few blocks from my home. He threatened my mother with doing something in revenge for being in jail so many years. I will move to live with my older brother in Quintana Roo and finish my secondary school there. Thank you all for the support you gave me and my best wishes to all. ELIAN RODRIGO TORRES ACOSTA (15 YEARS OLD): Thanks to PAI I now know what I want to be in the future which is to finish the preparatory school and attend the Autonomous University of Baja California. I want to obey my parents, get along with them and help them with house expenses. I want to respect more the people around me and enroll in a soccer team. I hope that in my future I meet other good people like the ones at PAI who taught me to believe in myself and to work hard on reaching my goals. I will always keep PAI and everyone (sponsors, personnel and school mates) in my heart. ¡GRACIAS A TODOS! JESSICA YESENIA SALCIDO MORALES (15 YEARS OLD): I want to pass the preparatory admission exam to attend “Cobach” and finish with an average above 9; I want to attend the Autonomous University of Baja California to study Gastronomy while also studying acting. I want to prove to my mom that I am responsible and trustworthy so she can be proud of me, in a few years I want to visit my family in Zacatecas. I want to become an educated person, get married and have children in 8 years. I am thankful to PAI because I learned to work as a team, to value what I have and to dream big. I will miss my classmates and my teachers who make me feel confident and for the knowledge to pass the admission exam to continue my schooling. I appreciate very much the time my teacher Amalia took to make us learn and laugh at the same time. I appreciate also that my teacher Maribel more than a teacher was my friend who always gave me good advice and for being such a good life example of good morals. I also appreciate all the work señora Juanita did to change my life for the better. I am especially grateful for the support of my adopted benefactors who took care of me and congratulated me for my achievements. Thank you for the financial help which made it possible for me to finish my Secondary education. Probably I will not be able to repay for your generosity, but I am sure that God will reward you with a wonderful life. 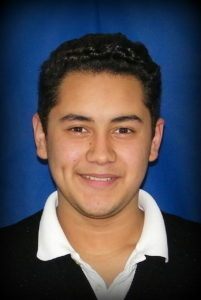 OSCAR ALBERTO LOPEZ VAZQUEZ (15 YEARS OLD): What is better at PAI than any other school is that we learned important subjects to get jobs, subjects such as Accounting, computers and English. Now that I graduate I know I will miss all my class and school mates. Surely in my next school I will not have sponsors to pay for my education, so thank you all very much for all you did for me during these three years at Panamerican Institute. As a short time goal, I want to get in better shape; I also want to keep, at least, an average of 9.5 in school. I want to have more friends and keep the old ones. I want to prove my family that I can be responsible and respectful. ANGELA GABRIELA HUERTA NAVARRO (15 YEARS OLD): I truly believe that in the three years I have studied at PAI I became a better person. I now know how important it is to be in control of your anger, to be responsible, on time and get along with people around you. Most of all I learned to work hard to make my dreams come true and be happy with who I am. I will surely miss all the love and extra time teachers and personnel gave me. I feel stronger now and able deal with any situation. Thank you everyone for your support! I want to attend a preparatory school called “Cetys” and pass every subject, attend the Autonomous University of Baja California to study Dentistry in order to have my own dental office. I want to get along with my family and visit them more often and, in 5 years, go visit my sister in Guadalajara. I want to have my own family and children. MELISSA MONTSERRAT RIVERA BENAVIDES (15 YEARS OLD): At PAI I learned that you do not need to have a lot of money to be successful, what you need is to make your best effort and never give up until you reach your goals. I also learned that we are not alone, that there will always be people sent by God to help us and that God will also give us the tools to help others when they are in need. Because I now believe that nobody is better than anybody else and even though I am young I could give advice as long as I am responsible, considerate, kind, just and respectful. What I will miss when I graduate are my teachers who so patiently helped me and Principal Paty who always congratulated me for my achievements, Señora Juanita for working so hard to have the best school for us. I will also miss my classmates who made me laugh when I was sad and when we all sat down at the same table at meal times. I am so grateful to all my sponsors for their unconditional support even when my grades were not that good. My future plans are to study carpentry and attend the preparatory school, finish it then start my own business. As I grow up I want to make new friends and become a better friend, by having empathy and giving them advice. I want to spend more time with my family and travel with them; eventually I would like to help my mom with the house expenses. JENNIFER ROSALES AYON (15 YEARS OLD): I thank my school and teachers for making me appreciate the things I have and the people around me. I will miss so much the scolding of Amalia to do things better and on time. I sure learned a lot from her! I feel so lucky to have sponsors who generously helped PAI stay open for all students who want a good quality technical education. I thank señora Juanita for paying attention to all our needs and work to satisfy them. I also thank our meals benefactors and señora Vicky for preparing all meals with such love. Without all these help I could not be ready to start the preparatory school and attend the University to study either Psychology or Teaching. My short time plans are to learn how to box, play the guitar and the accordion. I also want to be nicer and have more friends. I want to go out more with my dad and have an excellent relationship with my family. PAOLA MONTSERRAT ROBLES YAÑEZ (15 YEARS OLD): I give thanks to everyone at PAI who had been part of my life during the past three years. I appreciate the time, patience and love of teachers and sponsor who always had our best interest in mind. Thanks to the education I received here now I can attend the preparatory school called “Lazaro Cardenas”, the Autonomous University of Baja California and become a Graphic Designer. Of course my next few years are not going to be only for studying; I also want to go out more with my friends and eventually find the one I will spend the rest of my life with. I also want to travel to Coahuila, San Luis Potosi and Mexico City. For now, I want to enroll in a gym to get in good shape and also get along better with my family. 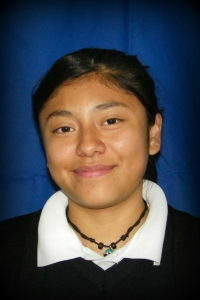 CARLA MELIZA LEYVA HADAR (14 YEARS OLD): First I want to thank Señora Vicky for their delicious meals she prepared for us every day, then I want to thank my sponsors and Señora Juanita for giving me the privilege of studying in this wonderful school and to all my teachers for giving me a good education. My goal is to improve my grades to 9’s and 10’s so my parents and sponsors feel proud of me. As a career, I want to become a flight attendant. I want to prove my parents that I can be responsible by helping them. I want to meet new people, and get along with everyone in my life. DENISE SALCIDO MORALES (15 YEARS OLD): I want to tell you that PAI helped me realize that all of us are important no matter what our financial situation is and that is the reason why we should be respectful of everyone from the littlest person to the oldest and more powerful person. We should be attentive of every ones points of view. That I believe makes me a better person. I will miss the meals, at the beginning I did not want to eat because in my home meals are different, but little by little I learned to eat different things, I even eat vegetables now! I will miss Spanish Grammar classes because Amalia taught me to be a stronger person with every scolding. I will also miss P.E., Civics, Physics, Chemistry, all my classes in general, teachers and the school itself. I am grateful because my sponsors helped me so much even though they do not know me in person. Every time I needed some special financial help they came to my aid. After graduating from PAI I would like to attend the preparatory school “Cobach” and after that the Autonomous University of Baja California. I also want to play in a professional soccer team. I will do my best to be friendlier, have better communication with my mom, my best friend and my family, I want to help my mom with house duties and stop fighting with my sister. JOSE FERNANDO TORRES SANCHEZ (14 YEARS OLD): The most interesting thing I learn at PAI was how to make science projects to participate at the yearly contest. My favorite subject was Physics. I am not sure if I will have teachers like the ones at PAI who patiently explained over and over again until we all understood the subject. I am grateful to all of them for that. I am also grateful to our sponsors for believing that I could do well in school and for providing us with hot breakfast and lunches every day. My short term goals are to play in a soccer team and have my driver’s license. I want to stop fighting my father so much, help build an extra room to our house and paint the house. I want to plant trees around my neighborhood, paint the graffiti off the walls and join a group that takes care of the environment. My long term plans are to study all that is necessary to have a Master’s Degree.